It takes some serious guts to start an entirely new bike brand, even more so when you’re committed to producing those bikes here in Australia. But that’s exactly what Sébastien and Gisella Deubel have done, recently unveiling their new all-Australian 2UP. Completely unintentionally, our first test ride on the new Deubel was on ANZAC day – we’d much rather be playing 2UP on the trails than in the pubs. When you paint a bike the same shade of orange as used by Lamborghini, you make a statement, and when the glossy 2UP rolled into our lives in a sun-burst explosion with blue accents we fell in love. There’s a special place in our hearts for its simple, single-pivot construction too; the Deubel looks instantly sturdy and reliable, with a certain industrial purposefulness. It’s easy to understand, incredibly user-friendly, and promises to keep you out of the workshop and on the trails. No corners have been cut with the materials either, with top quality Easton tubing used for the entire frameset. Not all single pivots are created equal, and the Deubel is well executed in this regard. The low, forward pivot uses a stout axle and Sébastien Deubel has devised the Encapsulated Swingarm System to boost the frame’s stiffness in the pivot area too. Essentially the chainstay member runs the whole way through the main pivot assembly, secured with long welds on all sides to reduce twist through the stays. It’s all very robust, as reflected in the fairly chunky 3.7kg frame weight, but this frame sure feels like it’s built to last. The swingarm drives a custom tuned Fox RP23, delivering 150mm of travel, and the shock is tucked neatly under the low-slung top tube giving easy access to the ProPedal lever. One consequence of the bike’s super-compact front triangle is a lack of bottle mounts, so it’s hydration packs only. The seat tube is a dropper post-friendly 31.6 diameter. We’d have loved to have seen cable routing provisions for a dropper post to make fitting one a cleaner affair. Speaking of clean, the rear derailleur cable and rear brake lines run internally through the chain stays, which is a neat touch. A full 1.5” head tube graces the front end, meaning the 2UP can be configured for the full gamut of steerer options available today. While we all dream of having one bike to do it all, the reality is that a few tweaks are always going to be needed to get the most out of a bike for different scenarios. This is why the 2UP utilises scores an adjustable head angle, bottom bracket height and chain stay length. The forward shock mount plate can be swapped to provide either a 66 or 65 degree head angle with a drop in bottom bracket height in the slacker setting. Interchangeable dropouts will give you either a 420mm or 440mm chain-stay length too. When you purchase the bike you get a choice of shock mounts and dropouts, meaning you can configure your 2UP to be either a nimble trail bike, or slacken and lengthen it for more stable downhill performance if that’s your focus. 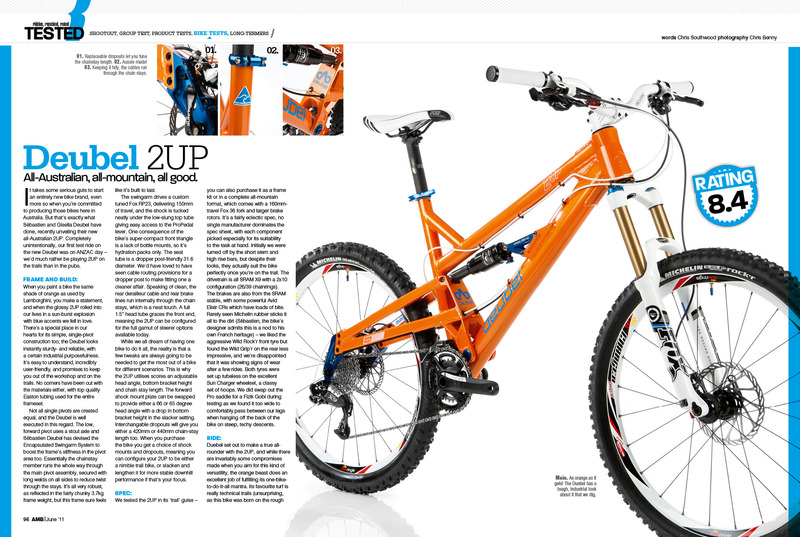 We tested the 2UP in its ‘trail’ guise – you can also purchase it as a frame kit or in a complete all-mountain format, which comes with a 160mm-travel Fox 36 fork and larger brake rotors. It’s a fairly eclectic spec, no single manufacturer dominates the spec sheet, with each component picked especially for its suitability to the task at hand. Initially we were turned off by the short stem and high rise bars, but despite their looks, they actually suit the bike perfectly once you’re on the trail. The drivetrain is all SRAM X9 with a 2x10 configuration (26/39 chainrings). The brakes are also from the SRAM stable, with some powerful Avid Elixir CRs which have loads of bite. Rarely seen Michelin rubber sticks it all to the dirt (Sébastien, the bike’s designer admits this is a nod to his own French heritage) – we liked the aggressive Wild Rock’r front tyre but found the Wild Grip’r on the rear less impressive, and we’re disappointed that it was showing signs of wear after a few rides. Both tyres were set up tubeless on the excellent Sun Charger wheelset, a classy set of hoops. We did swap out of the Pro saddle for a Fizik Gobi during testing as we round it too wide to comfortably pass between our legs when hanging off the back of the bike on steep, techy descents. 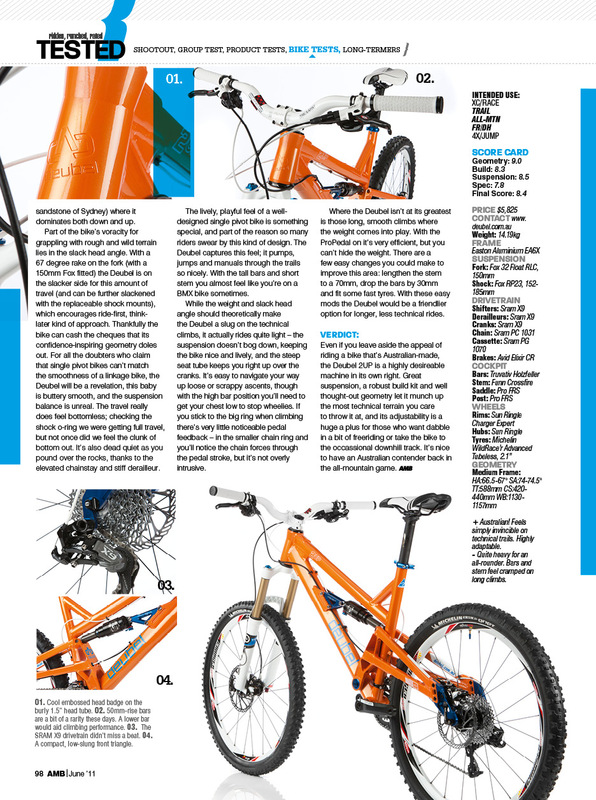 Deubel set out to make a true all-rounder with the 2UP, and while there are invariably some compromises made when you aim for this kind of versatility, the orange beast does an excellent job of fulfilling its one-bike-to-do-it-all mantra. Its favourite turf is really technical trails (unsurprising, as this bike was born on the rough sandstone of Sydney) where it dominates both down and up. Part of the bike’s voracity for grappling with rough and wild terrain lies in the slack head angle. With a 67 degree rake on the fork (with a 150mm Fox fitted) the Deubel is on the slacker side of this amount of travel ( and can be further slackened with the replaceable sock mounts), which encourages ride-first, think-later kind of approach. Thankfully the bike can cash the cheques that its confidence-inspiring geometry doles out. For all the doubters who claim that single pivot bikes can’t match the smoothness of a linkage bike, the Deubel will be a revelation, this baby is buttery smooth, and the suspension balance is unreal. The travel really does feel bottomless; checking the shock o-ring we were getting full travel, but not once did we feel the clunk of bottom out. It’s also dead quiet as you pound over the rocks, thanks to the elevated chainstay and stiff derailleur. The lively, playful feel of a well-designed single pivot bike is something special, and part of the reason so many riders swear by this kind of design. The Deubel captures this feel; it pumps, jumps and manuals through the trails so nicely. With the tall bars and short stem you almost feel like you’re on a BMX bike sometimes. While the weight and slack head angle should theoretically make the Deubel a slug on the technical climbs, it actually rides quite light – the suspension doesn’t bog down, keeping the bike nice and lively, and the steep seat tube keeps you right up over the cranks. It’s easy to navigate your way up loose or scrappy ascents, though with the high bar position you’ll need to get your chest low to stop wheelies. If you stick to the big ring when climbing there’s very little noticeable pedal feedback - in the smaller chain ring and you’ll notice the chian forces through the pedal stroke, but it’s not overly intrusive. Where the Deubel isn’t at its greatest is those long, smooth climbs where the weight comes into play. With the ProPedal on it’s very efficient, but you can’t hide the weight. There are a few easy changes you could make to improve this area: lengthen the stem to a 70mm, drop the bars by 30mm and fit some fast tyres. With these easy mods the Deubel would be a friendlier option for longer, less technical rides. Even if you leave aside the appeal of riding a bike that’s Australian-made, the Deubel 2UP is a highly desirable machine in its own right. Great suspension, a robust build kit and well thought-out geometry let it munch up the most technical terrain you care to throw it at, and its adjustability is a huge plus for those who want dabble in a bit of free riding or take the bike to the occasional downhill track. 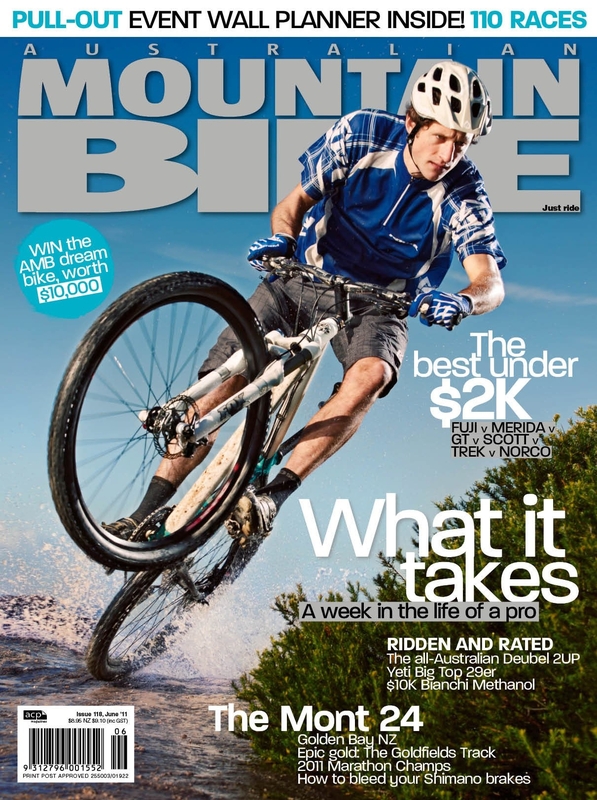 It’s nice to have an Australian contender back in the all-mountain game.